A huge hit in Japan, the Cook-Zen microwave pot is finally available in the U.S. and will change the way you cook. No more slaving over the stove—the Cook-Zen creates healthy, amazingly delicious meals in minutes. Tokyo and New York City-based cooking expert Machiko Chiba invented this award-winning original product after ten years of experimenting with microwave ovens. The Cook-Zen’s patented design locks in moisture, bringing out the natural bold flavors and vibrant colors of ingredients. Extremely short cooking times also ensure that the nutrients in your foods are better preserved. Unlike typical microwave cooking, there is no need for constant stirring—the Cook-Zen heats food evenly without drying out ingredients. Whether you’re cooking breakfast, lunch, or dinner—the Cook-Zen does it all. 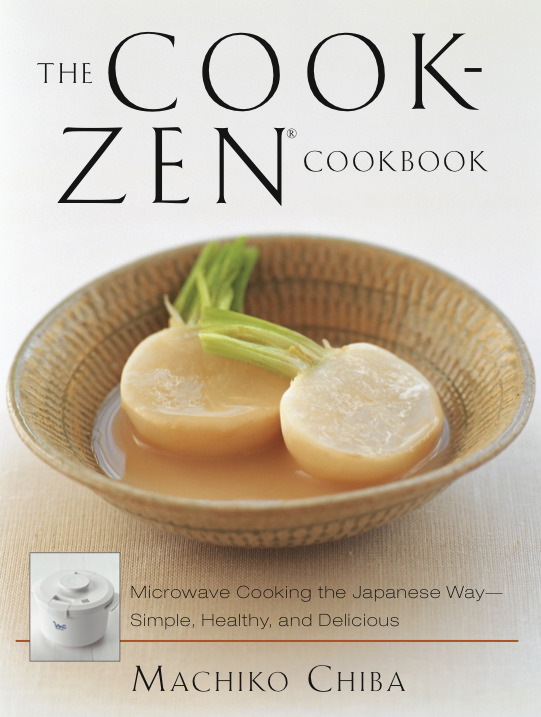 To accompany the Cook-Zen’s debut, THE COOK-ZEN COOKBOOK features an exciting collection of recipes with over 80 Japanese-style dishes that have been simplified for the home cook. Author Machiko Chiba has imaginative offerings for every occasion. Japanese classics such as Eggplant with Miso Sauce and Teriyaki Chicken are perfect for weeknight meals, while more inventive fare—Smoked Salmon Sushi Rolls and Steamed Mussels in Butter Soy Sauce—are perfect for entertaining.